Our kitchen is the heart of our home regardless of how old we are. Here are three bloggers in different phases of their lives with kitchens to match. Kim is the founder and owner of her blog The Kim Six Fix, dedicated to home projects, renovations and family living. As a mother of two young girls, Kim decided that it was time to update her ’80s kitchen into something that would better suite her family’s needs. Staying within her budget of $5,000, she stained her kitchen cabinets white while splurging on a five-burner stove that would save time when preparing family meals. Kim opted for the island with open shelving, as shown, as a means to display her favorite things. Her kitchen has evolved to meet not only her young family’s needs, but also her own. 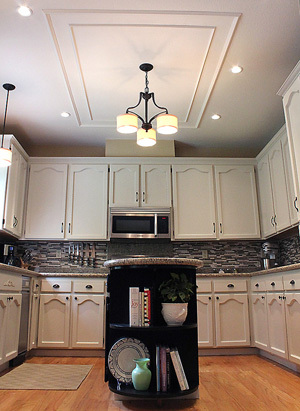 The paint, the backsplash and all of the fixtures were done by no one other than Kim. She added hardware to cabinets to avoid any little fingerprints, something that she may not have thought of prior to having two little girls six and under. Erin, recently married to a man with a larger-than-life personality like her own, is the mother to two dogs and a lover of fashion, decor, DIY and a great bargain. She started her blog, Live Pretty on a Penny, to merge her love of home decor and beauty, as well as to chronicle herself and her husband as they update their new home. The couple chose to update their kitchen to meet their own needs by modernizing it, yet keeping the home’s traditional style. Knowing that this is not their “forever home,” Erin mentions that they wanted to keep their renovations small, but with a big impact. Little changes and a slight facelift gave Erin and her husband the change they were looking for without gutting their kitchen while keeping within a small budget — two things that are very important to newlyweds in their first home. A grandmother and retiree, Marty, author of the blog A Stroll Thru Life, and her husband made the decision to downsize their home. They chose their new home based on the neighborhood and workable floor plan, but it needed a few updates to feel like home. 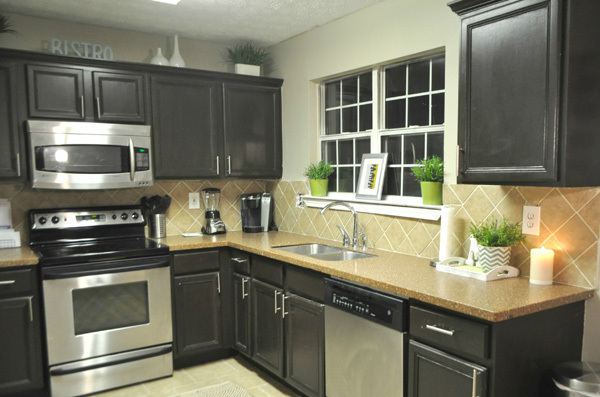 Marty decided to spruce up the dull cabinets and white walls in the basic builder kitchen with dark chocolate-brown paint and better lighting fixtures. Marty’s favorite part of her kitchen renovation is her island. Marty mentions that she loves the island not only for its beauty, but also for its functionality. 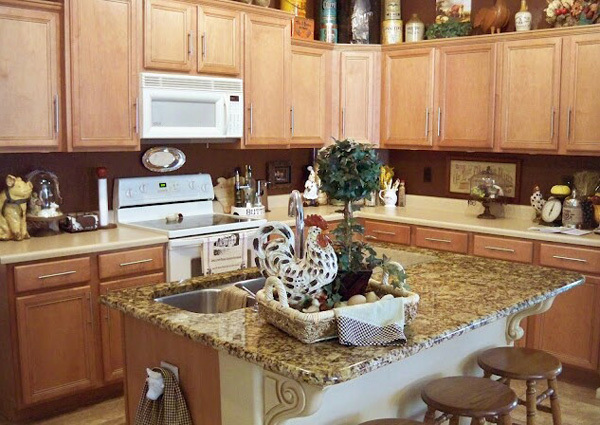 Not only does she have the space to cook and entertain as she likes, but she can also relax and sip a cup of coffee. She mentions that her new kitchen represents her new casual and slower lifestyle.